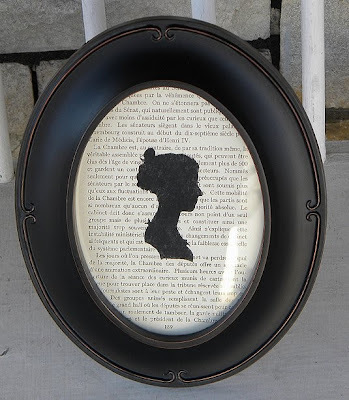 Framed Austen Silhouette - Etsy Update! I almost don't want to post about it, but I'm so hopeful at least one of the things I'm reporting comes true that I won't jinx it by admitting them. We may actually, after years of not being able to - travel!! 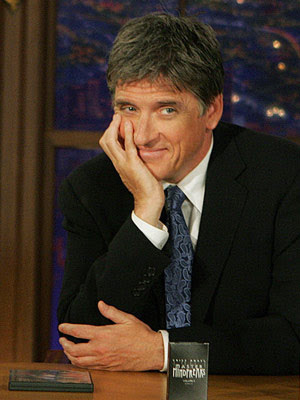 Go see a celebrity do stand up - and not just any one - THE one - the man my mother has fallen in love with and jokingly calls her 2nd husband - Craig Ferguson!!! 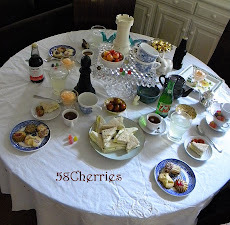 Now, I like him, too, but my mother has gone totally insane for him in the past few months and it may be noted now that my mother has taken 58cherries to twitter (entirely on her own - she doesn't contribute to this blog and I haven't even read her twitter yet so it is two different people so there is no confusion, but we share the name). We'll be going to Chicago for the taping - just a weekend trip. And best of all for me is to visit the museums again as the last two times my trips got cut way short and there is so much there I want to see still. I sooooo hope I am up to this trip in time. Please let my back heal faster!!!! I will take my wheelchair, I think. It'll be necessary, I fear with all the walking in the museums. But - yippee!! Now this isn't ironclad so I probably just jinxed it, but what the heck, I went to Boston once and LOVED it. We were exceedingly lucky to get my mom's work to okay the time period it would have to be during - it's my father's business trip. She would LOVE Boston and I so want to show it off to her. The only trip better (than Hawaii, really) would be Seattle - I hated going to both coasts without her as she'd love them even more than I did. So maybe, just maybe Boston!!! Lobster rolls - actually I prefer crab, seafood chowders, fresh fish, a little trip to Salem maybe, who knows how far around we'll get to go - I've been to their excellent aquarium as I'm the type of gal that visits every city's aquarium for some reason - just love them. (warning to those who visit the Boston aquarium - watch where you park, they have a little parking trap nearby and our rental car was towed - baaaad experience). So - does anyone who lives/lived/traveled there who has any recommendations for what we should see while there?? Oh, I have already been to the Isabella Stewart Gardner museum and loved it - have to take my mother there. But seeing as how I probably jinxed it...oh well. LOL I want to see the two Holbeins they have there and the Mary I portrait again - they were wonderful to see the first time and I can just stand there an STARE at the beautiful work that went into those paintings. So there you have it - one trip locked in pretty much (we have the Ferguson tickets) and maybe Boston!! Oh, I hope we get to go to Boston or at least Pensacola - we desperately need a vacation longer than a weekend - I can't remember how many years it has been now - not even a weekend trip - which means it is far too long. Cross your fingers for us, please?? And any restaurant tips for Chicago or Boston are much appreciated. And also - my mom's hoping to see Craig at Carnegie Hall with her sister (my Fairy Vintage Godmother, btw) - it's a slim chance but one I hope they get to do - they both deserve it!! Sorry it wasn't a crafty or decoration post - actually it would have been if somone hadn't hidden my camera on today of all days - grrr!! Hopefully it won't be overcast tomorrow and I can actually figure out the camera I got for Christmas - it's a more complicated than I'm used to and I haven't even tried it out for myself yet. It'll be fun to see if I get a decent pic. Happy Monday!! I know mine has been. I'm sick of winter, aren't you? I mean if you also live where it is cold and gray right now, I mean. But then, the change in seasons does inspire creativity, right? Surely I'd get bored with the same old weather all the time like California, Hawaii, etc. Um, nah. But let's pretend I like the changes in seasons, and I do - to a point. And at this point I am through with aches and pains and cold and want warmth and flowers and...okay, I'm whining now. Ahem - this is a post of inspiration, not whining. There's no whining in decorating!! Uh oh, Tweety got out of his bird cage, thank goodness he isn't real and can't make a mess in my bedroom. 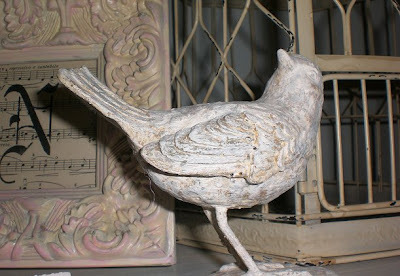 I bought him at Hobby Lobby and vintage-y whitened him up to improve him with my own paints, to my taste. I like him. He's quiet yet he's always cheerful. 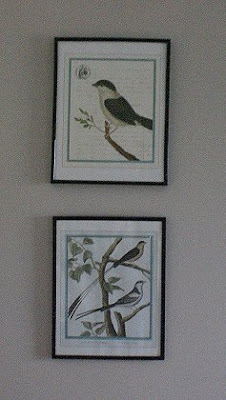 These two birdy pics are by the french doors of my house and next to the couch - I love them. 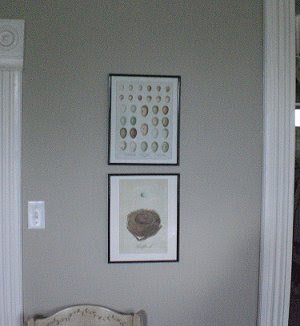 And then I have nest and egg prints across the room in between the restroom door and the main door - I love these especially around Easter, but really all year round. So cute!! And I'm not just obsessed with birds for spring. This actually is my spring/summer picture - it is always up, though I change it around a LOT. I LOVE this picture - got it online at a poster store. The frame and matting? Super cool find of perfect match in the clearance aisle of Homegoods - took out the icky painting and slipped in the cool one. It looks way cooler in person. keep in mind all these pictures are taken with bad lighting and darn gray skies. 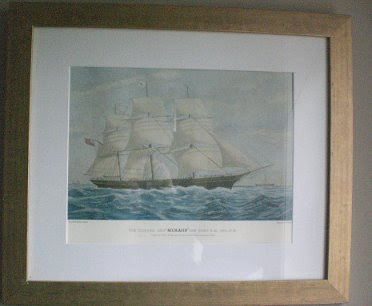 I love ships - always did, but after seeing Master and Commander the movie, and then reading the Patrick O'Brien books that it was based on (okay not all of them - there are 20! I read half of them so far) - ohhh, did I fall in love with ships. I've just dusted off and proudly displayed our model ship, which is huge and the only place it fit was on top of our fridge for now since the usual spot has a TV on it now. LOL I don't have a pic of that yet, but let me tell you, it's impressive. Also, I have a smaller model ship in the upstairs bathroom on the shelf around the room. 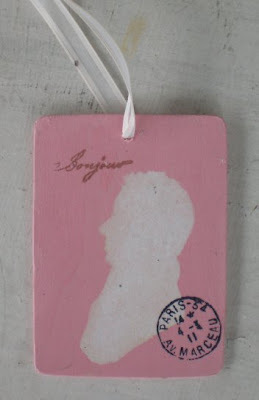 Oh, and a teeny tiny model that's also an ornament in my room hanging from my armoire knob. Um, yes, I love ships. And the Captain Aubrey and Stephen tales - if you liked the Russell Crowe movie - oh, do please do pick up one of the books to try!! It all starts with how the captain and surgeon met - nearly dueled!! And then, well - go find out yourself. If you love Austen, this is like Austen kinda for guys as it was written by a man and has plenty of action and adventure, and plenty of subtle or outright humor, but I have tons of girlfriends online and my own mother and we are all fans. It's like what's missing from the Jane Austen novels when their men are away at sea - and there is plenty of romance, too - oh Jack and his love Sophie (there's an Austen style romance - swear to god) - Stephen and his infuriating Dianna... Um, sorry, rambling. But if you're looking for well written books and sick of rereading Austen - those are great ones. 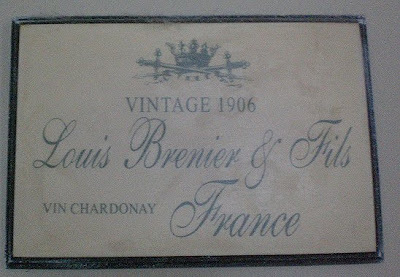 Now this last one - is just a fake vintage wine label (though heavy and rather well made, I picked it up at a discount cabinet/flooring/etc. store). That's it for now - more spring inspiration coming soon. Have a great weekend!!!! 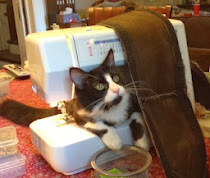 Thanks to Hope for posting her excitement over winning my giveaway - you can see her post here. So sweet, thanks Hope!! 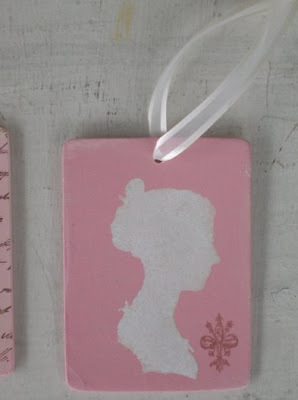 And actually she won two - the one she showed is just one with two sides to it and she picked the white silhouetted couple with the plain pink background and already an ornament. I love the postcard feel of that ornament and I have to admit I think she picked the best two - she's got good taste, if I do say so myself. My, what an ego I have. I'm also sending one to Heather, who gave me such a sweet ornament herself a long time ago and I've been meaning to return the favor for quite some time, so I really hope she likes it as much as I like hers - I keep hers on my bookshelf so I can look at it all the time. As for everyone that missed the giveaway - it's my own darn fault for being so last minute. It was a spur of the moment decision and I didn't give enough warning. I'm sorry for that. I'm still new at this and I'll do better next time, I promise. 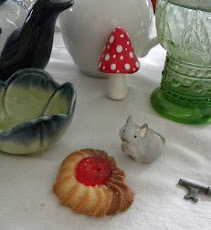 Really, a few days is nothing in blogland - real life makes us miss stuff going on like this unless we have lots of time on our hands and especially since there are SO MANY cool blogs to follow. So, I'm really sorry if you're disappointed. I'll do another giveaway soon and give much more time for everyone to have a chance, promise!!!! Valentine's Day really snuck up on me - doesn't it always feel that way?? It does to me. I'm kinda like those clueless guys you see roaming the stores on Valentine's Day itself hopelessly trying to make it in time. Usually it's a Walgreens, but once it was a Target and I was just shopping and I suddenly noticed, there's an awful lot of guys here in the store (way too much testosterone in the air - Target's got gadgety stuff, but they were roaming the decorative items aisles a little too much)...and they were really looking desperate...ooooooh, it's Valentine's Day! I laughed to myself and it cheered me up that I didn't have a Valentine myself, because it's okay - guys don't buy into it much and even though they are bombarded on TV, Internet, newspapers and any other store they go to - they STILL don't think ahead of it. Only, uh oh - my girlfriend/wife/lover is going to be so pissed!!! I like the holiday for the colors and the hokey romantic idea of it all - romance needs a holiday, even for us lonely singletons. I'll just pop in an Austen film and pretend I'm marrying Mr. Darcy or something hopelessly needy like that. And while I'm on that topic.... Have you seen the new Emma on PBS? I saw parts of it because, I have to admit, it isn't my favorite novel/film. Especially the Paltrow one. But I kinda liked the ending I saw - I (hopefully successfully) tivo-ed it to watch next time they play it. And they advertised a new Persuasion! Hmmm, I doubt they can top the Amanda Root (do I have the right name?) version - her Captain Wentworth just is soooo convincing. And that sister Mary - boy she gets me everytime, I wanna shake her and smack her one - Anne is a little too doormat for my taste. But, those uniforms! Those dresses and the jackets! Swoon. See, I don't need anything, but my dvd player to enjoy valentine's day - and maybe some chocolate. Gee, it's a toughie, but the winner is, let's see....ummmm. HOPE! Thank you Hope for commenting. I hope you really do like the valentines because you get two of them. And I even waited til 2 in the morning to see if anyone else had even the slightest interest. Please email me the details - which ones and if the one or both aren't ornaments and you'd like them to be I'll fix them up in a jiffy. And that concludes my sad, sad, sad little giveaway. One week until Valentine's Day - no time to finish my other items much less post or sell them so I decided to give one away. You have your pick. Here's a pic of them, but for more pictures look at the post a few down from here and make your choice when/if you win!! 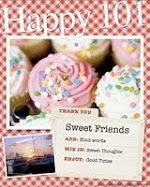 I'll pick a winner on first thing Wed. Feb 10th so hurry! I'm hoping it'll get to you by Valentine's Day, it should, it'll fit in a regular envelope, at least if you live in the US, otherwise I have no idea how long it takes. Edited to add: In fact, let's be more generous - there will be TWO winners. Double your chances! 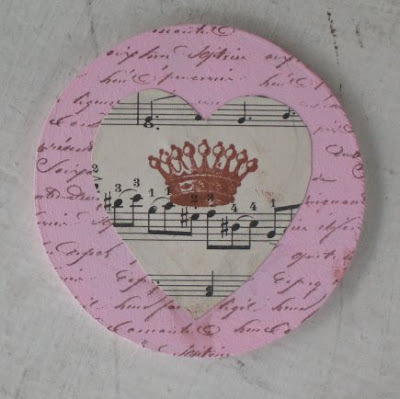 So Happy Valentine's Day a little early - comment for your chance to win!! 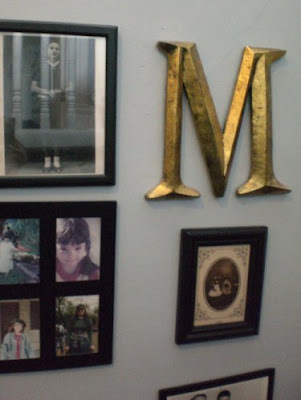 You will notice it is mostly vintage pictures, all genuine ancestors - no cheating with garage sale or flea market pics. The top left one is a really cool old fashioned wedding photo with my grandma as the flower girl. The one below it - my grandfather looking handsome in his Marine uniform - he fought in the South Pacific in WWII and was nearly killed, but saved by his helmet when a bullet hit it and stopped just short of killing him. Thank goodness for that or my dad and I wouldn't be here. :) There is another older ancestor picture copied from my grandmother's album, a large D to stand for my dad - Daniel as that is his side of the family. Below the D, though, starts my mom's side of the family: my Yiayia and Papu (grandma and grandpa in Greek). Yiayia gave it to me and I display it with pride. Looking up the stairs you can see the picture I have there at the moment, I change it frequently. It's a painting by my very talented mother of a folk art rendering of their wedding photo. It's beautifully done and reminds me of the Frida wedding portrait - folk art clothes and making the way she paid such attention to detail. She did it in the mid-eighties when I was about five or six - made the most gorgeous and perfect painting and then just stopped. Always promised to paint me - never did. She's a great artist and it's so frustrating her lack of time and commitment. 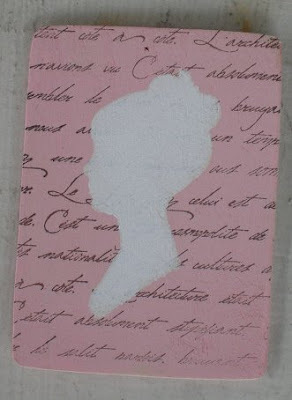 I won't show you the painting up close because...well, I fear copycats. Yes, it's that good in my opinion. And if she won't make anymore I want it all for myself, selfishly. Sorry. She's slowly losing dexterity in her hands now thanks to Lupus, Reynaud's and early arthritis, I really wish I could get her to paint again, but I've pretty much given up. 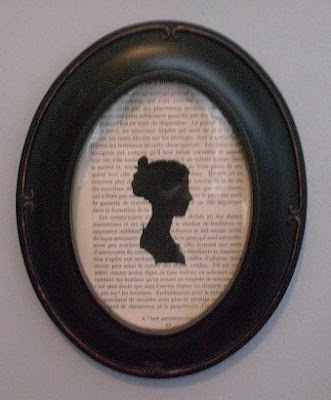 And just for fun I added this to the wall, a silhouette on a Vintage French book page. I like it and I think it suits my family wall. It's my small contribution. 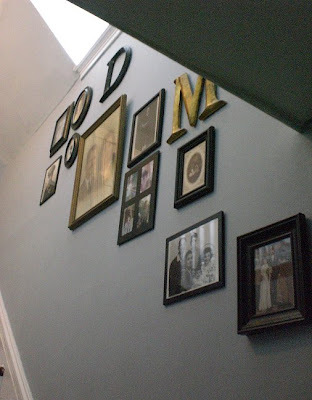 Just a glimpse and maybe inspiration for making your own wall of photos. I suggest different shapes and maybe a color or two, but try to keep a little unifying theme or color going throughout. 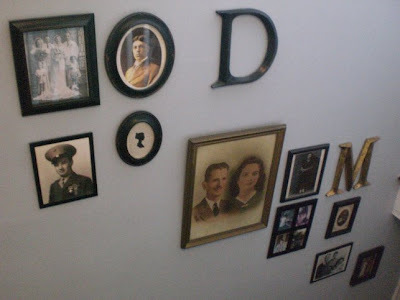 All, but the heirloom picture of my Greek grandparents, are in black frames. I feel the gold M balances it out, though. No white frames or stained wood ones. That's what is slowing me down - finding the right sized black frames for certain photos. Also having to have someone hang them for me and help me keep it looking balanced. 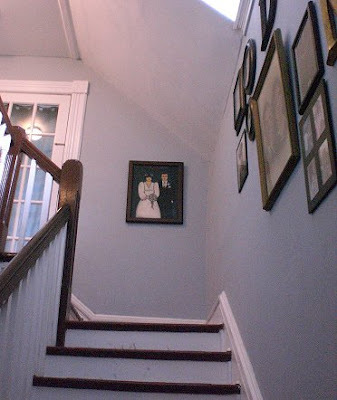 I'd love to add also a small antique mirror or two to let light bounce off the wall and help lighten up a rather dark lower hallway. The skylight above isn't quite enough. Anyway, that's my wall for now - it's the only place we really display personal photos - everywhere else is full of art we pick up. I have a few pics of art that is up for early spring and I'll share them wih you another day. 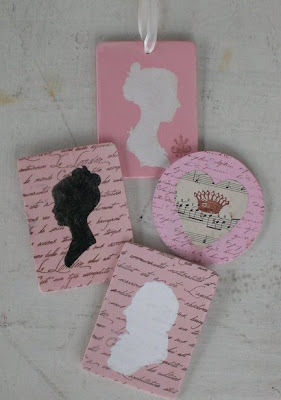 I've been working on a few Valentine related items, but these are the first to be finished. 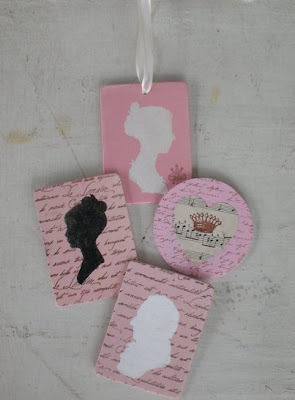 You may notice they are all different shades of pink, light to dark and with different backgrounds, one is mixed media with Mona Lisa's eyes and crowns and a heart cut out of vintage music paper, the rest are silhouettes. I was just having fun with them. One was already made as an ornament, but the rest are not, I can alter them to be ornaments or leave them alone. Those captivating eyes, the medieval writing on the background makes me think of da Vinci's journals and sketches - like it is his handwriting. 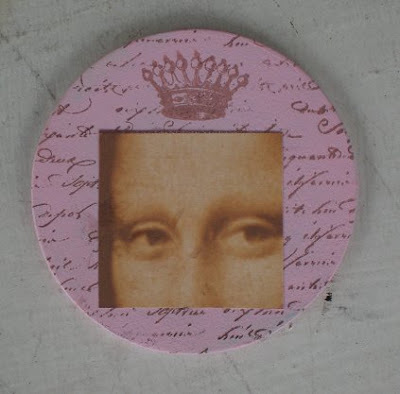 It's one of my newer stamps and I love it. 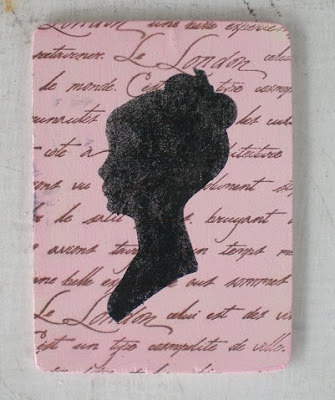 A typical silhouette by me, French text, black silhouette of an Austen style young girl. On the back, her bethrothed? Her husband? 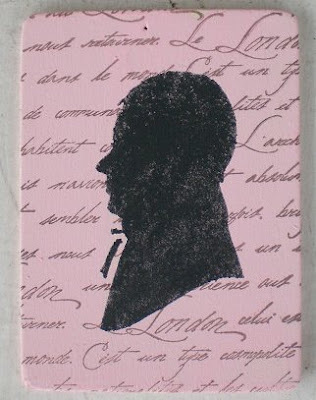 On the back, another Austen style man. 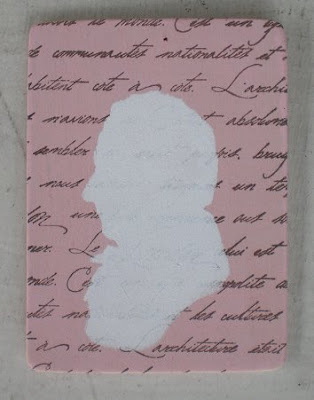 All of these rectangular silhouettes are on wood, the general size of a standard playing card. They have teeny tiny holes so you could thread a piece of thread through them or ignore it, they just come that way. Or, if you'd like any of these as ornaments with wider thread I can drill a slightly bigger hole as is already done in the ones without text back grounds. Please note - all are different shades of pink. I've been playing around with the colors and I like the varying shades of pink. This one was completed just as I was finishing up Christmas ornaments. It has a very pretty white ribbon as you can see, there's a glimpse of the other valentines in the side, you can see how much darker a pink this ornament is from the others. I like the postmark stamp and the Bonjour and little fancy fleur de lis stamps on these. Oh, also, thanks to tip on how to remove spam, I've removed comment moderation for new comments, older comments are moderated just so I can see them and read them or otherwise I'd miss them. So feel free to comment! This is the coat just plain buttoned up, a bit on the boring side - needs a little accessories, but all I have to show at the moment, sorry. 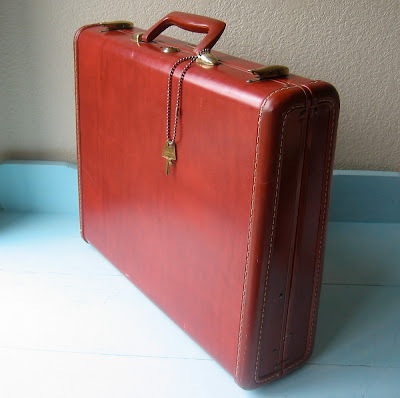 Should have snagged one of my red purses at the very least, right? Check out that rounded color, the vents - they are all over - it's like a coat dress, with two buttons in the back, too. Just too cute not to buy it with such perfect details and fine quality. I can't wait to wear it with a cute skirt and tights - here I just wore my typical jeans as it was a quick outing and I thought it'd be too cold for a skirt. 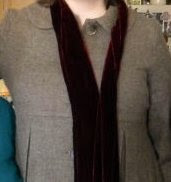 But this coat deserves a nice dress or skirt and some fantastic mary janes. I owe it to the coat. 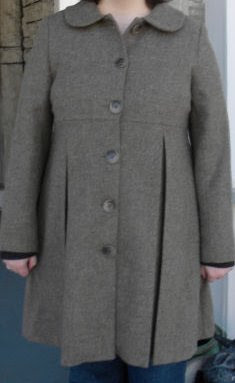 If you are interested - it wasn't cheap and I did have a bit of trouble getting it - took quite some time to come through, but for a quality London coat like this - well worth it. I can't believe they named the color so ugly, though - Donkey?? Not appealing, Saltwater...cute company name, but you need better names for your colors - if I hadn't seen how cute it was on Emily I never would have thought to buy a donkey colored coat. I only wish they had this in dark red, too. Not that I could afford two. LOL If you want more info on where exactly to find it let me know, I had some trouble at first, myself. Next post will hopefully finally show off some of the work I've managed to do. Can you believe it's February already?? I've also updated a few items to Etsy tonight and tomorrow I will photograph and add more. Be sure to check it out! !